Most women at some point in their lives have struggled with their weight. And if you’re over 30 and have and access to social media, magazines, television, movie theaters and/or advertising (plugging anything from sports cars to carrot juice) you’re probably not down with fat. It’s an ugly word. It says so much in the space of three letters. If you’ve ever been called the F word, you know exactly what I’m talking about. Lazy, slob, gross, ugly, unfuck-able; these are all judgmental derivatives of the word fat. Even if we’ve never been considered remotely fat by our friends and family, chances are we’ve obsessed over the numbers on our scale at some point between learning to shave our legs and perfecting liquid eye-liner. I was a stripper addicted to cocaine for the better part of a decade . 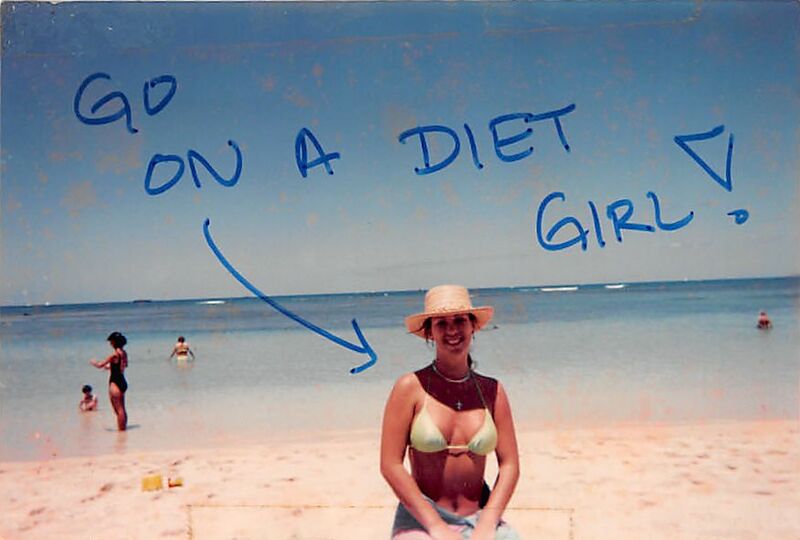 THIS PHOTO of me (my own words in bold) was taped to my refrigerator for YEARS. I want to wrap my arms around her and do everything I can to make her see what I refused to believe because of my inner-bully telling me I wasn’t enough. Enough for what? More tips on stage? More validation I was attractive? The beautiful, curvy size-12 woman I am today looks at this photo and wants to simultaneously laugh and cry. I’m not posting this to brag about being a stripper, or show off the bikini bod I wish I still had (and never appreciated). I’m posting this photo as a reminder for us all – including the media – to help young women see the beauty in their bodies, no matter what size. Think about it. What chance do young women have if our standards are navigated by the skewed perception that skinny equals enough? To be fair, I was a chubby high-schooler and my stripper period took place during the waif era. Still, I can’t help but wonder – what was I thinking (more on this later)? What started out as a personal quest to get to the bottom of my twelve-day migraine (landing me in the ER twice) ended up being the very beginning of a new adventure: discovering, learning about and living with this ticking time bomb. Truth? I thought a brain aneurysm was a stroke. But after a crash course with a couple of top-notch neurosurgeons, I now know better. I learned that an aneurysm of the brain is a weakened area of a blood vessel. 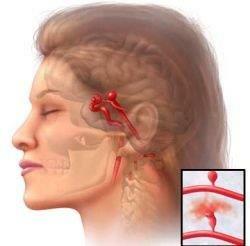 If it ruptures, this causes bleeding in the brain – which is called hemorrhagic stroke. Roughly fifty percent of people will die immediately, the other half, brain-damaged. If. Rupture. Stroke. And, scene. If. Those two letters joined at the hip have been a storm cloud hovering above me since my diagnosis. It’s one of those words that, when on automatic replay is guaranteed to heighten anxiety, perpetuate insomnia and toss you around in a cyclone of worry and fear.